Ladies and gentlemen, this is not a drill. We repeat, this is not a drill. 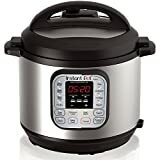 The Instant Pot DUO60 6 Qt 7-in-1 Multi-Use Programmable Pressure Cooker is the most popular Instant Pot on the planet by a very wide margin, and it’s back on sale at a discount today on Amazon. It retails for $100 and it’s on sale for $81, making this a great time to pick one up if you don’t already have one. The larger 8-quart model and smaller 3-quart version are also both on sale today, but only at a $10 discount.